Adaptive leadership skills are crucial in human services agencies, many of which are still grappling with the tremendous capacity issues brought on by workload increases surrounding the crumbling of the national economy nearly a decade ago and the implementation of the Affordable Care Act (ACA). Despite significant investments in technology that promised to solve these workload challenges, our customers are still waiting 20 to 30 days for the decisions they so desperately need. Our technology innovations helped us organize those 20 days of unfinished work, but they have yet to help us eliminate it. Automation of existing practices seemed like the best way to respond to these challenges, when in reality, the answer was much simpler: We must first evaluate and redesign our service delivery pipeline — the method through which the work of reaching an eligibility determination is actually completed — to address our capacity challenges, and then we can utilize technology to automate the strategies we have put in place. The redesign and reinvention of how we work is very different from how we automate our work. There is always a role for technology, but automation is not innovation. Redesign efforts bear more fruit and allow agencies to better utilize automation than hoping the automation alone will produce radical results. A truly adaptive leader embraces this nontraditional thinking to develop innovative solutions that yield real, lasting improvement. If you are one of the many human services agencies that chose to rely solely on automation and technology in the face of mounting caseloads and the advent of the ACA, you might be asking yourself, “Isn’t the whole point of these new IT systems not to have to redesign how our work gets done?” This is the largest, most expensive misconception in government — that new eligibility systems will handle the increased demand for services and make work time more efficient. New technology solutions play a role in assisting with the automation of our work and making reporting and data collection easier, but they do not, on their own, make significant strides in helping states increase capacity and serve more customers. Technology automates our work, but the work is not where we struggle. To complete an eligibility determination, staff requires about 30 to 60 minutes of work time, yet it takes several weeks for customers to receive a final determination. The total time from first interaction to determination is what we call elapsed time. The gap between that elapsed time and the time when the work is occurring is between 95 percent and 99 percent; that is where the opportunity really lies. Automation tends to focus only on the work time, which is such a small percentage that even a 50 percent improvement in work time only affects 5 percent of the total elapsed time, for an efficiency savings of only 2.5 percent overall. Because we lose the majority of our time in the gap, a process redesign must focus on why we struggle to find the time to do the 30 minutes of work. The struggle for a faster determination begins with the pressure to find the 30 to 60 minutes you need when the lobby, or call center, is full of customers all hoping to get help that day. To get through the line, offices do a smaller portion of the 30 minutes of work and the remaining work is shifted to a later date so they can get to the next customer. This “pend” work now requires additional work to track, manage, and eventually complete. 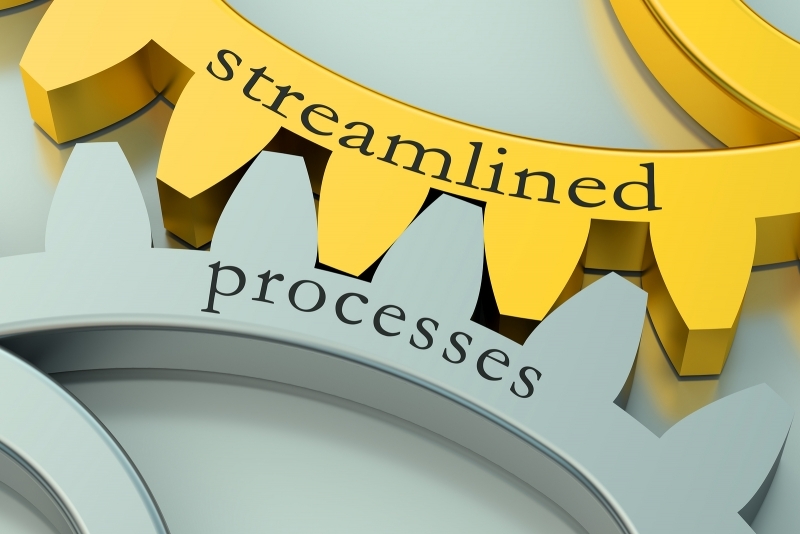 Many IT solutions focus on making this extra work easier by allowing sophisticated “pend” queues, the electronic transfer of applications, customer appointment scheduling solutions, and access to data needed to manage the pended applications and backlog. At best, these attempts help us manage the problem, but avoid addressing fundamental issues that originally caused the problem. The root cause of the problem is that the vast majority of customers are in the lobby, or calling in, because their applications are already in the pend queue and the customer is trying to move it along. Our data, gathered from redesigning the service delivery in more than a third of the states in the country, show that each pended customer requires between one and 2.5 hours of additional staff work time to come to a final determination and 10 to 15 days to the eligibility process (the total elapsed time). This additional “self-created” work robs staff of its capacity to do new work and forces even more pends. We have unintentionally created a perpetual cycle of work that will never allow us to catch up unless we change how we work. And while you might believe we don’t have the capacity to spend more time up front with customers to arrive at a determination, pending creates far more work in the long run. How bad is the problem? About 80 percent of the people calling in or waiting in the lobby for service are not new customers. Multiple interactions with the same customer that, in many cases, are unnecessary. In the states we have worked with, the average customer typically came into contact with the state or county agency, in-person or virtually, three to five times from the time of application to eligibility determination. The longer a case remains in pending status, the greater the opportunity for customers to get in touch with staff. Inconsistencies in business practices and how the work is done. Our eligibility workers interview, verify, and document cases differently. These inconsistencies create more work because no one can finish someone else’s case actions without re-starting the entire process. If the number one issue draining capacity is unnecessary multiple customer interactions, let’s resist the temptation to track and organize them through automation. Instead, just eliminate the number of contacts. The only way to truly do this is by applying what we call a First Contact Resolution approach to every customer interaction—in person, over the phone, or by simply processing a piece of paper. The goal of a First Contact Resolution approach is to do everything within our control to complete the eligibility determination when first interacting with the customer or the case (within policy constraints that vary from state to state). This means not scheduling appointments, not relying only on the customer to gather verification (electronic resources, employers, etc. ), by applying policy consistently, and avoiding “stacking and tracking” and to get everything you need from customers before they hang up or walk away. Initially, your overloaded workers will resist the concept of First Contact Resolution. It seems counter-intuitive to add time to the interview or determination process. What they quickly realize, however, is that those 10 additional minutes spent up front will save them from handling more customer contacts—and the associated work that comes with it. 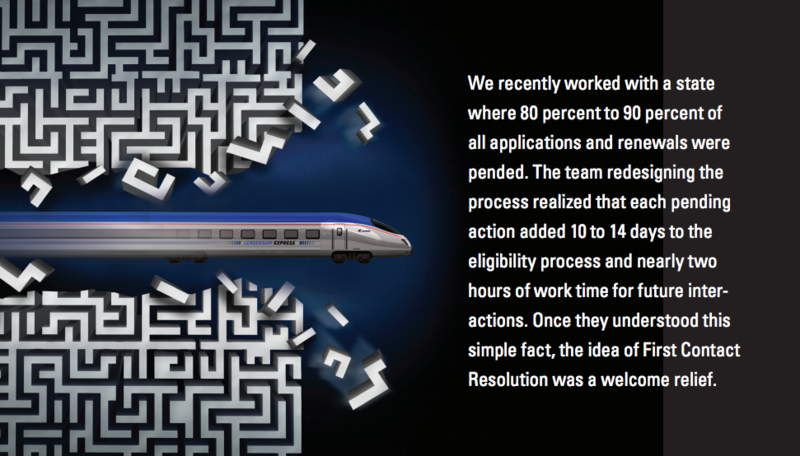 We recently worked with a state where 80 percent to 90 percent of all applications and renewals were pended. The team rede- signing the process realized that each pending action added 10 to 14 days to the eligibility process and nearly two hours of work time for future inter- actions. Once they understood this simple fact, the idea of First Contact Resolution was a welcome relief. The second biggest issue draining staff capacity — inconsistencies in how we work—can easily be reduced through the development and consistent use of eligibility tools, measuring the right operational metrics in real time, and standard business practices. We define rework as any instance when one worker cannot finish someone else’s case without restarting the entire process. It could be that the first worker didn’t follow the correct process, failed to document the actions taken, or wrote so many case notes that the finisher found it easier to pick up the phone and ask the customer the same basic eligibility questions. Consistent eligibility tools encourage people to do the eligibility work itself in a more standardized manner. For example, interview scripts identify the specific questions everyone should be asking when processing similar cases, a verification matrix ensures all workers use a consistent set of verification requirements, and a case narrative template ensures workers document in the same manner to eliminate the desire to re-interview the customer. Real-time tracking of operational metrics, meanwhile, allows you to assess inconsistencies in the model and address the root cause of the problem. All of these strategies are designed to foster consistency and eliminate rework to make more efficient eligibility determinations. As an adaptive leader, you possess the perspective and vision to understand that addressing the core problem within your agency — lack of capacity and its impact on service delivery — will be the best innovation you can bring to your customers and staff, whether or not you have already decided to pursue automation. The difference between redesigning your business processes and putting in place the IT solutions that focus on managing our problems is we can address the fundamental ways of how we work, break the perpetual cycle, and teach our workers how to serve more people through two simple steps: apply a First Contact Resolution approach and implement consistent eligibility tools and standard business practices. Our goal is not to monitor the pend queues better, but rather to reduce the number of pending cases by 80 percent. It is not better tracking pending work, but reducing the number of times we interact with customers. Our goal is not to manage the backlog, it is to get offices caught up and ensure they never get behind again.